“Chotto Desh” is the first ever dance work for children created by the Akram Khan Company, adapted from his acclaimed production, “Desh“. On Friday (October 23) www.asianculturevulture.com saw its world premiere at Dance East in Ipswich. 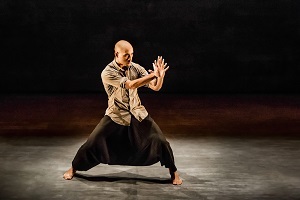 Phillipines-born dancer, Nicolas Ricchini was trying to convince the audience with a great deal of success – that he was Akram Khan as the story of the production is so personal. (He will be alternating this with dancer, Dennis Alamanos, because it is a physical demanding solo piece as the dancer is on stage for duration of 50 minutes). 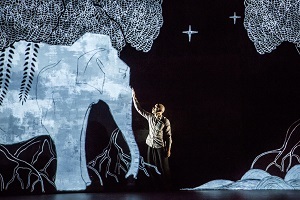 “Chotto Desh” or ‘Small Homeland’, as the title suggests draws on the cross cultural story telling style of Akram Khan Company to tell the story of a young British Bangladeshi man, who dreams of becoming a dancer! The show begins with an irate young man, ‘Akram’ asking a Bangladeshi call centre, Tech support assistant – how to get into his phone because he has lost his password – while negotiating the busy noisy streets of an imaginary Dhaka road! “You sound like a child? “I am 12 years old,” comes the reply. There’s a lot of humour in the performance and the piece is punctuated with individual scenes – all drawn from Akram Khan’s own personal story. The piece is interspersed with voiced over text in Bengali and English. The text has been written by poet and writer, Karthika Nair – who was also part of “Desh” and Khan himself. The production is directed by Sue Buckmaster, an acclaimed puppet maker whose company, Theatre-Rites, has been at the forefront of providing inspiring site specific, cross art form work for children. Buckmaster spoke to www.asianculturevulture.com and explained how the project came about. She said that she met Akram Khan a few years ago and they kept in touch. “I was introduced to Akram way back when I did ‘Mischief’ (the show toured from 2007-2009) a dance piece with my company Theatre Rites that was performed at Sadler’s Wells. “We make work for children in dance and he was just beginning to make Desh and we talked about being on stage doing a solo piece. The long and short of this is that Buckmaster, acquired a video performance of the show and began to watch it continuously for six months considering the ‘child friendly’ aspects of the production as well as talking to Khan about the process of making the show. In the end, they selected 25 minutes of the original material and decided to create new work for the rest of the production, which was more in tune with children’s sensibilities and would be true to the original ethos of “Desh”. 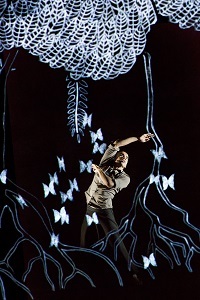 Buckmaster worked with, assistant choreographer, Jose Agudo, who has worked with the AKDC on several projects including, “Desh”, “Torobaka” and this one. “Chotto Desh” has at its core, the father /son relationship and explores the dynamics of having a dual identity of being British and Bangladeshi. There is a beautiful sequence where Akram behaves like a typical teenager who is asked by his dad’s voice (incidentally played by Akram himself) to “come and help me with my work”. We already know that his dad uses his hands to cook and feed people and in the UK has a restaurant. His Dad is telling him things like: “Take on some responsibility, Man Up”; so the teenager rushes into his bedroom (delineated by a square on the floor) – expresses his pent up rage and his egotistical sense of self by doing some boxing, Michael Jackson and hip hop moves as well as Kathak dance, before finally acknowledging to himself and revealing to his father. There is a lot to enjoy in this finely made production of “Chotto Desh” – from the dance, to music, the story-telling as well as the animation. There is a haunting music score by Jocelyn Pook and the visual animation is created by Yeast Culture. On that evening, there were several giggling children who really got it and the grownups were also mesmerised. The show has a long tour across the UK is being presented by MOKO dance – a dance partnership promoting dance to children and their families and led by Dance East, a dance agency based in Ipswich, and will be touring several venues across the UK until December 5. It has been selected by the Mayor of Newham to be the ‘must see’ show for Year 6 schoolchildren. These are the borough’s 10 to 11 year olds who are in the last year of primary school. before they have to make choices to into secondary school. They will be able to see “Chotto Desh” at a long run at Stratford Circus from January 16-23 2016. It will then enjoy an international tour from February 2016 onwards. Do go and see if you especially if you want to know whether he recovered his password or not! * Further UK dates have been added (to those first published below). The show has a tour across the UK is being presented by MOKO dance – a dance partnership promoting dance to children and their families and led by Dance East, a dance agency based in Ipswich, and will be touring several venues across the UK until December 5. Win AR Rahman concert tickets, live at the O2 in London! I benefit from perusing your websites. Thanks! Extremely individual friendly site. Enormous information readily available on couple of clicks on. The information and facts mentioned within the post are several of the ideal readily available. Here are some links to web pages that we link to simply because we believe they’re really worth visiting. dropjysor,Thanks for sharing such an amazing blog. I am so happy found this informative blog. cqcxbpont,Thanks for sharing this recipe with us!! nkcyqrehoo,Hi there, just wanted to say, I liked this article. It was helpful. Keep on posting! llppxlq,Hi there, just wanted to say, I liked this article. It was helpful. Keep on posting! ineofds Yeezy 350,Thanks for sharing this recipe with us!! ferrwzha,Thanks a lot for providing us with this recipe of Cranberry Brisket. I’ve been wanting to make this for a long time but I couldn’t find the right recipe. Thanks to your help here, I can now make this dish easily. wwfzbtfpgh,Very informative useful, infect very precise and to the point. I’m a student a Business Education and surfing things on Google and found your website and found it very informative. uqtoqckkm Yeezy Shoes,If you have any struggle to download KineMaster for PC just visit this site.